Welcome to the cotton fiber directory section of the Apparel Search website. In this section, you will find educational information and links to resources relevant to cotton fibers. If you work in the apparel industry or simply have an interest in cotton textiles, this is the area for you. If you know of additional information or links that regard to Cotton, please Contact Us and we will add the information to these pages. If you work for a company that supplies cotton textile products, you can use the add your company link at the bottom of this page to create a listing on the Apparel Search cotton directory pages. If you wish to read more about cotton, don't forget to visit the textile news section. More specifically, view the textile fiber news or the cotton fiber news. Also, if you work in the fashion industry or textile industry, please join us at the fashion industry network for discussions about the use of cotton. Smart consumers and apparel manufacturers want to learn more about Cotton. Barnhardt (USA): The cotton textile side of the company has broadened in scope since the beginning of the company, supplying cotton products to many new markets. The business that began by supplying cotton batting for cushioning material has developed into a major worldwide supplier of bleached cotton for medical, health and beauty aids, and nonwoven fabrics. Their original bleachery was built in 1929. Recognizing the growing demand for bleached cotton, Barnhardt constructed a new bleachery in 1979 and expanded it once again a decade later. Throughout its growth, Barnhardt's focus has always been -- and continues to be -- pointed toward the highest quality standards, customer commitment, and support of the local community. Manufacturers of hydro-peroxide bleached cotton fiber for the textile and nonwovens industries. Also, dental, medical and personal care products from cotton fiber. Cotton Council International: the international division of the National Cotton Council of America. Cotton Market Comments: from Swiss Financial Services, Inc.; daily news and commentary on New York cotton futures, for cotton traders. Cotton Marketing Weekly: weekly newsletter devoted to a discussion of the cotton situation and outlook, for growers, processors and end users. Extension service of the Mississippi State University, and compiled by Dr. O.A. Cleveland, Jr.
Cotton Outlook: United Kingdom news and indices of worldwide cotton marketing and prices. Public access area provides links to information, conversion tables, calendar of events and comprehensive glossary of terms. From Cotlook, Ltd.
Cotton Pickin' Web: portal to organized information on cotton. Has numerous links covering all issues of interest to producers and processors of cotton fiber. International Cotton Advisory Committee: an association of governments having an interest in the production, export, import, and consumption of cotton. Journal of Cotton Science: The multidisciplinary, refereed Journal of Cotton Science contains articles that improve our understanding of cotton science. Publications may be compilations of original research, syntheses, reviews, or notes on original research or new techniques or equipment. All manuscripts, volunteered or invited, are submitted electronically and directed by the editor-in-chief to the appropriate associate editor for a double-blind peer review. The Journal of Cotton Science is published four times a year by The Cotton Foundation. Naturtex (Peru): Ecological Textile Products Naturtex manufactures eco-textiles on contract for private label companies and prepares annual collections of yarns, fabrics, and apparel under their trademarked names, Pakucho, Morrope, Native Cotton and Vicuna Cotton. Combining these unique capabilities, Naturtex has built a solid reputation for being a well connected and reliable contract manufacturer and exporter. They service some of the most demanding and complex international eco markets. Nunn Cotton Co., Inc: USA. International marketing agency for the cotton trade. Weekly newsletter with analysis of market activities and trends, and other topics relevant to cotton. List of links to cotton related sites. owned, cotton marketing and denim manufacturing cooperative headquartered in Lubbock, Texas. They are the world's largest producer and supplier of Texas-style cotton and their American Cotton Grower's (ACG) division is a major denim manufacturer renowned for innovative, high-fashion denim fabrics and customer service. Since its creation in 1953, PCCA has grown to become one of the largest handlers of U.S. cotton, marketing millions of bales annually. In addition to cotton marketing based in Lubbock, Texas, PCCA also owns a denim mill in Littlefield, Texas and cotton warehouse operations in Altus, Oklahoma, Liberal, Kansas and Sweetwater, Texas. Annually their production capacity is 12-15 thousand tons and they make production as per ISO 9002 standards. They export the cotton yarn to EU and especially to USA. If you do not find enough information in this section of our cotton fibers guide, you may wish to check the textile section or go back to the fiber directory main page for additional textile fiber choices. 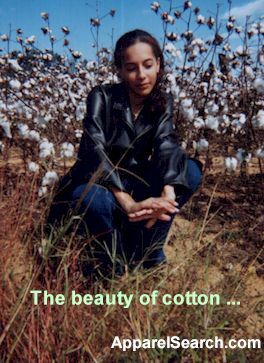 Learn about women's cotton clothing. Learn more by reading Cotton News.